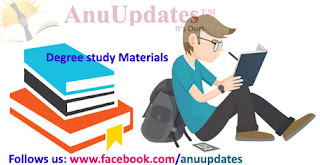 ANU UG B.Com (Res) 3rd Sem Office Automation Tools (OAT) Material all five units for downloading is now available, the candidates who are waiting for materials can download them from here. Here you can get all nagarjuna university degree materials for all semesters. The material provided here is very easy to read and understand. Each concept is explained in simple way with necessary diagrams.